The Visual & Performing Arts Academy’s Creative Writing teacher, Dr Gretna Wilkinson, was selected as Red Bank Regional’s 2016 Teacher of the Year. The honor is determined by a committee which reviews the recommendations from staff, students and parents. Dr. Wilkinson came to RBR in 2005 after a 16-year long career as a professor at County College of Morris. She has grown RBR’s Creative Writing Program to be one of the most popular in the school, graduating class after class of adoring students who learn to express themselves in their words and dramatic poetry performances. “They (her students) fill me with joy watching them come into their own. I feel that I am the woman lucky enough to get to watch a flower open up with the sun,” she states. 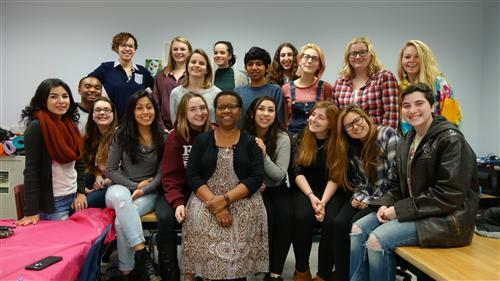 Dr. Wilkinson provides a living example and inspiration to her students as an accomplished poet and performer. She has written five books of poetry, including her most recent, “Opening the Drawer” published in 2011. She was published in many publications including Poets of New Jersey: From Colonial to Contemporary, The Literary Review, Spindrift, Sensations Magazines, Carriage House Poetry Series among other journals. She has been featured in several news outlets including The New York Times, Newark Star Ledger, Home News Tribune, Courier News and has been interviewed on several radio stations including WNYE in New York City. She has performed in venues throughout the country through her affiliation as a Geraldine R. Dodge Poet and with fellow poets comprising the Cool Women Press. She has spent countless hours editing the poetry of New Jersey prisoners. As an NJPAC artist-in-residence, she has worked with many children in the inner cities, helping them give voice to their feelings in poetry and prose. Several years ago, she was recognized as Arts Educator of the Year from the Monmouth County Arts Council. Dr. Wilkinson discovered the power of words early in her life. Through the public education she received in her rural, native Guyana, she became an avid poetry writer who also wrote and performed plays. Her avocation as an educator took shape at the age of 17 when she left her home to become a missionary teacher in the jungles of South America. She immigrated to the United States with her family in 1981, where pursued higher education earning her bachelor’s, master’s and doctorate, the latter two from Drew University. Her poetry has seen her through some very difficult life experiences. This is a gift she transmits to her students who have delivered some of the most heart-felt and powerful performances at RBR’s assemblies and Echoes and Voices Performance programs. “You know how you say that little children do not know boundaries? That their dreams are bigger than their bodies? Well, this is a dream so big I barely knew how to dream it. The fact that I get to be with these young people five days a week, 10 months of the year for four years of their young lives is more fulfilling than I can describe,” she expresses. For a gifted poet who could describe anything with words, that says a lot.